Discover magnificent cities, picturesque villages and a landscape of rolling hills and vineyards on a self-guided walking holiday through Chianti country from Renaissance Florence to Medieval Siena. Hike along cypress-lined country roads and white gravel tracks, traversing forests of oak, beech and chestnut. Your accommodation for the first two nights of your holiday is conveniently located in the heart of Florence. If you have time after checking-in, we recommend taking a walk around the city's magnificent squares and along the illustrious Arno River. This walk starts and ends in the Piazza della Signoria and takes about three and a half hours. Widely regarded as the cradle of the Renaissance, Florence is a city which impresses at every turn. From the Duomo Cathedral to the Ponte Vecchio Bridge and Michelangelo's spell-binding statue of David, there is so much to discover. A visit to the Uffizi Gallery is a must, with its abundance of canvases by Botticelli, Leonardo da Vinci and a host of other greats. After a twenty-five minute public bus ride to Settignano, your walk commences from this picturesque hillside village. Along your route, you will pass magnificent cypress trees, olive groves and Renaissance villas, with a view of Florence below you. Upon your arrival in the charming town of Fiesole, we recommend spending time exploring its Etruscan ruins, Roman amphitheatre and Franciscan monastery. You can either choose to return to Florence by public transport from here, or extend the walk by strolling back to Settignano via another route. 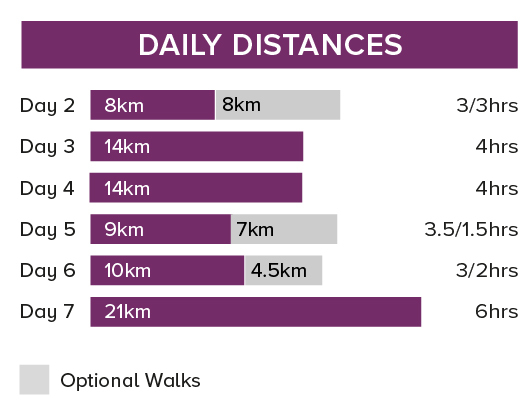 Depending on whether you choose the one-way or circular walk, you can expect today's eight and 16 kilometre walks to take approximately three and six hours, respectively. After breakfast, you take a private transfer by car to Montespertoli - a rustic market village set in the rolling green hills not far from Florence. Here, you will find your hospitable agritourismo accommodation that will be your base for the next two nights. Once you have settled in, head out for a stroll through the open countryside to the north of the town, with views of vineyards, olive groves and isolated farms perched on hilltops. Later, return to your hotel for a refreshing dip in the pool. You can expect today's 14 kilometre walk to take approximately four hours. Today's circular walk affords another opportunity to enjoy the picture-perfect landscape around Montespertoli. This time you walk south, through the Chianti Fiorentino area, passing by old parish churches and elegant country villas. After breakfast, a short car transfer takes you to the village of Gambassi. From here, you will start your walk along the Via Francigena - a 700 year-old pilgrim route to Rome, which is thought to have originally started in Canterbury, England. The track affords spectacular views of the surrounding countryside and takes you into the centre of the walled Medieval town of San Gimignano - your base for the next two nights. You can expect today's 17 kilometre walk to take approximately five hours, although the route can be shortened to nine kilometres and three and a half hours, should you wish. 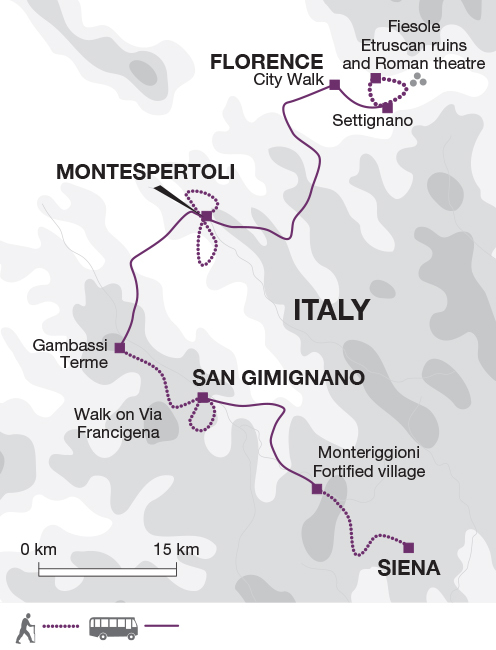 Today, you have the choice between two relatively gentle circular routes around San Gimignano. Both take you along cypress-lined country lanes and past vineyards and fields, taking in the picturesque hamlets of Monteauto and Santa Lucia. Depending on which route you choose, you can expect today's 10 and 14.5 kilometre walks to take approximately three and four and a half hours, respectively. After breakfast, take a private transfer to the fortified village of Monteriggioni. From here, your walk takes you to the marvelous city of Siena, famous for its biannual "Palio" horse race, held in the beautiful shell-shaped Piazza del Campo. The narrow streets of this fantastically-preserved Italian jewel are bursting with imposing Medieval palaces, interesting museums and awe-inspiring churches that are well-worth exploring. During your time here, we particularly recommend a visit to the Duomo, as well as climbing to the top of the bell tower. You can expect today's 19 kilometre walk to take approximately five hours. You will need one main piece of baggage and a daypack sufficiently large to take everything needed for your walking day, such as your water bottle, snacks, spare clothing and camera. Your main luggage will be transferred to your next accommodation in the same vehicle used to transfer you to your next walking destination on days 3, 5 and 7. Please clearly mark all your belongings with your name and the name of the next accommodation. We recommend outbound flights into either Florence or Pisa airports which are served by both budget (including Easyjet, Ryanair) and non-budget airlines (including British Airways) from multiple airports in the UK. For this trip you can fly into Florence or Pisa airports. From Pisa airport, you can take either a direct train or bus to Florence. To return from Siena to Florence there are direct SITA-TRAIN buses departing nearly every 30 minutes. See www.trainspa.it or www.sitabus.itita-toscana/Firenze%20-%20Siena.pdf for departure times and prices. The buses leave from Via Tozzi/Piazza Gramsci close to San Domenico church. There are also trains from Siena to both Pisa and Florence. See http://www.trenitalia.com/tenitalia21.html for timetable and prices. Comprehensive arrival and departure information is provided in the Destination Manual that you will be sent when your booking is confirmed. On this journey you walk 77 km over 6 days (an average of 13 km per day with the opportunity to extend or enjoy longer alternative walks on 3 of the days). You will mostly be walking on 'strade bianche', compacted gravel roads typical of Tuscany, as well as mule tracks on undulating hilly terrain. Mon 22 Apr 2019 - Wed 1 May 2019 Your trip can depart anytime between the above dates. Contact us for triple room requests and solo traveller prices. Thu 2 May 2019 - Sun 12 May 2019 Your trip can depart anytime between the above dates. Contact us for triple room requests and solo traveller prices. Mon 13 May 2019 - Sun 9 Jun 2019 Your trip can depart anytime between the above dates. Contact us for triple room requests and solo traveller prices. Mon 10 Jun 2019 - Fri 19 Jul 2019 Your trip can depart anytime between the above dates. Contact us for triple room requests and solo traveller prices. Sat 20 Jul 2019 - Sun 18 Aug 2019 Your trip can depart anytime between the above dates. Contact us for triple room requests and solo traveller prices. Mon 19 Aug 2019 - Wed 28 Aug 2019 Your trip can depart anytime between the above dates. Contact us for triple room requests and solo traveller prices. Thu 29 Aug 2019 - Sun 13 Oct 2019 Your trip can depart anytime between the above dates. Contact us for triple room requests and solo traveller prices. Mon 14 Oct 2019 - Thu 31 Oct 2019 Your trip can depart anytime between the above dates. Contact us for triple room requests and solo traveller prices. Wed 1 Apr 2020 - Mon 13 Apr 2020 Your trip can depart anytime between the above dates. Contact us for triple room requests and solo traveller prices. Tue 14 Apr 2020 - Thu 30 Apr 2020 Your trip can depart anytime between the above dates. Contact us for triple room requests and solo traveller prices. Fri 1 May 2020 - Tue 19 May 2020 Your trip can depart anytime between the above dates. Contact us for triple room requests and solo traveller prices. Wed 20 May 2020 - Mon 22 Jun 2020 Your trip can depart anytime between the above dates. Contact us for triple room requests and solo traveller prices. Tue 23 Jun 2020 - Sat 18 Jul 2020 Your trip can depart anytime between the above dates. Contact us for triple room requests and solo traveller prices. Mon 20 Jul 2020 - Fri 14 Aug 2020 Your trip can depart anytime between the above dates. Contact us for triple room requests and solo traveller prices. Sat 15 Aug 2020 - Tue 25 Aug 2020 Your trip can depart anytime between the above dates. Contact us for triple room requests and solo traveller prices. Wed 26 Aug 2020 - Mon 12 Oct 2020 Your trip can depart anytime between the above dates. Contact us for triple room requests and solo traveller prices. Tue 13 Oct 2020 - Sat 24 Oct 2020 Your trip can depart anytime between the above dates. Contact us for triple room requests and solo traveller prices. Sun 25 Oct 2020 - Sat 31 Oct 2020 Your trip can depart anytime between the above dates. Contact us for triple room requests and solo traveller prices.